Here is a scene that ought to warm the cockles of your heart. There’s no subject quite like a wooden trestle for sheer modeling interest. This one is located on former Chesapeake and Ohio trackage in Richmond, Indiana. This C&O line came up from Cincinnati on its way to Chicago. 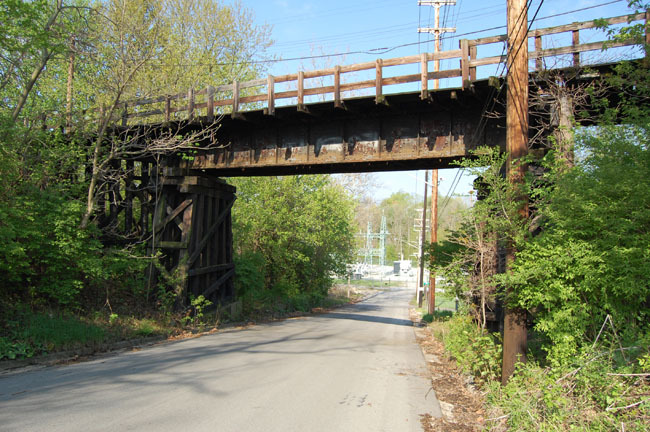 It climbed the famed Cheviot Hill out of the Ohio River valley and in the steam era was the home to Mikados and 2-6-6-2 mallets because of the many tight curves and light bridges. Diesel power consisted of F-units, Geeps and U-boats. Amtrak’s Cardinal passenger train also traversed this route. The route through Richmond was especially picturesque as it skirted the eastern rim of the Whitewater Gorge for most of its passage in town. There was a small yard and an interchange with the PRR. The line also served the Hayes Track Appliance Co. (now Western-Cullen Hayes), the maker of the Hayes car stops and other track appliances. The company’s founder, Stanley Hayes, moved the company to Richmond in 1911 and later donated a generous portion of his estate to be preserved as a regional arboretum. Getting back to the photo, this trestle dates back to the near turn of the twentieth century, when a tidy little 4-4-0 and passenger cars graced the rails. The photo holds clues to the current state of affairs for the line, for which I’ll give a hint: it isn’t good. See if you can figure it out. There’s a wealth of modeling possibilities here. What do you see? Oct. 11, 2011, What do you see? -6 continued: One of the comments suggested that the railings and walkway seen in the photo at the top of the post aren’t original to the bridge and wouldn’t have been there when the line was in service. Well, I’m sorry to say that’s incorrect. As the photo below shows. You’ll have to forgive the streakiness of the photo. It’s at least forty years old, if not older. 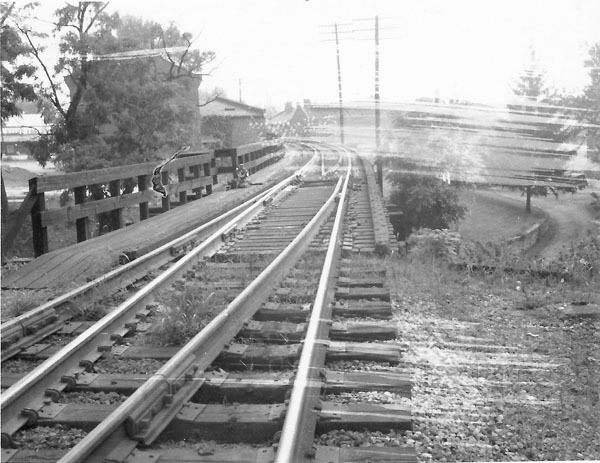 This is the topside view of the bridge, which was located on the south end of the C&O Yard in Richmond. The turnout here is the first one off the main into the yard, and as you can see, the points were on the bridge itself, hence the walkway. You can hopefully see how the walkway and railing extend out to accommodate the swtichstand, which is illuminated. 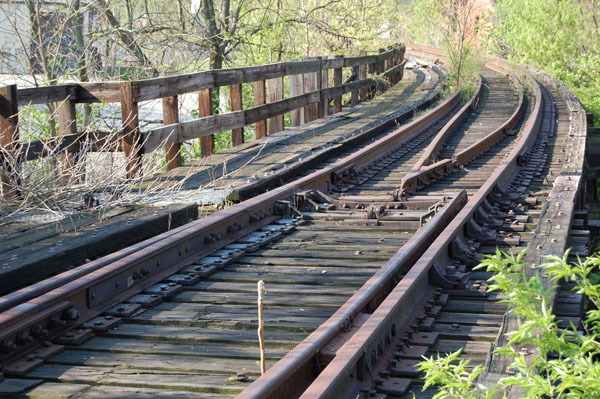 Notice too, how the curve on the bridge is superelevated, and that the walkway extends the length of the trestle. As Matt noted, the vegetation is kept well away from the trestle and the roadbed is in good shape overall. This wasn’t a big yard, in fact it was typical of how we tend to model towns on a layout, There were only a few tracks, a run-around and some industrial sidings, including one to the Hayes Track Appliance Company. Yes, That Hayes Track Company, the only who made the bumpers and derails. As I outlined in the “Walk on the Wild Side” post, Stanley Hayes located the company in Richmond in 1911. It is still there, a few hundred feet to the left in this photo. Today, the rails are gone except for those left on the bridge itself, and the weeds have come to stay. Looks like a hike n bike trail now. Would not have the wooden guardrail if it was in service, nor would it have planks on the bridge crossties, nor would the trees be so close. Must be a street with low amount of truck traffic too, no bridge clearance signs. You’re close on two counts. You’re right about the vegetation. The railroad would have kept it cleared. You’re also right about the overhead clearance sign being missing. I have to deduct points about the the railing though. Let’s see if Pete or anyone else weighs in on the discussion, and in a few days, I’ll post additional material to explain the situation surrounding this bridge. Ha, interesting bridge indeed! Was thinking that the “kickout” was some type of strange location for people to stand and look at something on a hike n bike trail. The wood just does not look that old! Never thought about a switch on a bridge. Great bridge, makes an interesting model. Like how the guard rails end right before the points. Interesting looking casting a t the end of the guard rails. Have never taken the time to look at the end of a guard rail to see how they are joined. Yes, it is an interesting bridge and the turnout adds a unique twist. Guardrails ended in a number of ways. Sometimes they just tapered in to a point and were spiked in place, others times a casting like the one seen was used. Notice also that there seem to be different sizes or lengths of tieplates used just before the turnout and, that the switch details are spaced according to the bridge tie spacing instead of conventional tie spacing. There’s also a gap in the ties for the throw rod. The more I look at the pictures, the more interesting I find the bridge. Wonder why outside guardrails were not placed as well. Just relying on the wooden guard timber in case of a mishap. What was the speed limit on the bridge? As you’re aware the timber guard rails are a common practice. Although I’m not certain, I think their main function is to help secure the ties in place. Obviously, they wouldn’t do that much to stop an errant car. I’m not certain what the speed limit on the bridge was. Speed was not a real factor on this line due to the many curves. It was built on the roadbed of a former interurban line if I recall. You are correct, the wooden guard rails help secure the bridge ties. I have just one more question for you. I was looking at your color photo of the bridge and I noticed a gap in the guard rail casting at the end and the guard rail on the right hand side. Was the guard rail broken? I have noticed broken rails a lot on seldom used/ questionable in service sidings and spurs. An extra “tidbit to model. Great bridge, makes for an interesting model. Yes, I believe there is a break in the one guardrail. I’m not certain what caused it.